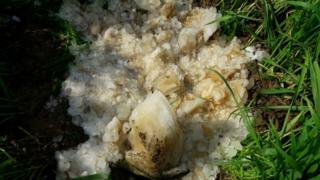 Indian officials suspect an icy ball which fell on a village in the northern state of Haryana is frozen human waste leaked from an aeroplane overhead. The 10-12kg (22lbs - 26lbs) chunk of ice fell on Fazilpur Badli village with a "big thud", startling residents on Saturday. Senior Gurgaon official Vivek Kalia told the BBC some villagers thought it was an "extra-terrestrial" object. Plane toilets store human waste in special tanks. These are normally disposed of once the plane has landed. But international aviation authorities acknowledge that lavatory leaks can occur in the air. Mr Kalia told the BBC that a sample of the projectile had been sent for chemical analysis, but "we suspect strongly" that it is frozen airline excrement. "It was a very heavy icy ball of ice which dropped from the skies early on Saturday morning. There was big thud and people of the village came running out of their homes to find out what had happened," he said. "Some villagers thought it was an extra-terrestrial object. Others thought it was some celestial rock and I've heard that they took samples home," he said. The Times of India newspaper reported that people "sneaked a few pieces into their clothes", stored them in refrigerators at home. A senior official of the Indian Meteorological Department, who examined a small sample, said the projectile was "definitely not a meteorological phenomenon". In January 2016, a woman in central Madhya Pradesh state suffered a severe shoulder injury when she was hit by a football-sized chunk of ice which fell from the air and crashed into the roof of her house. A newspaper said that she may have been hit by frozen airline waste. Modern commercial aircraft cruise at high altitudes, and the sub-zero temperatures outside cause any liquid to freeze immediately. The resulting ice then breaks off the plane, gaining speed as it falls to the ground far below. Most ice will break up on descent. Frozen human waste very occasionally forms around the overflow outlets for aeroplane toilets, and then falls to earth. They are often called "blue ice", because of the chemicals added to the toilets in planes to reduce odour and break down the waste. Britain's Civil Aviation Authority, for example, has said that around 25 falls of "blue ice" are reported every year from the 2.5 million flights a year over UK airspace.